Location-based technology paves the way to contextual personalised information and content for passengers. 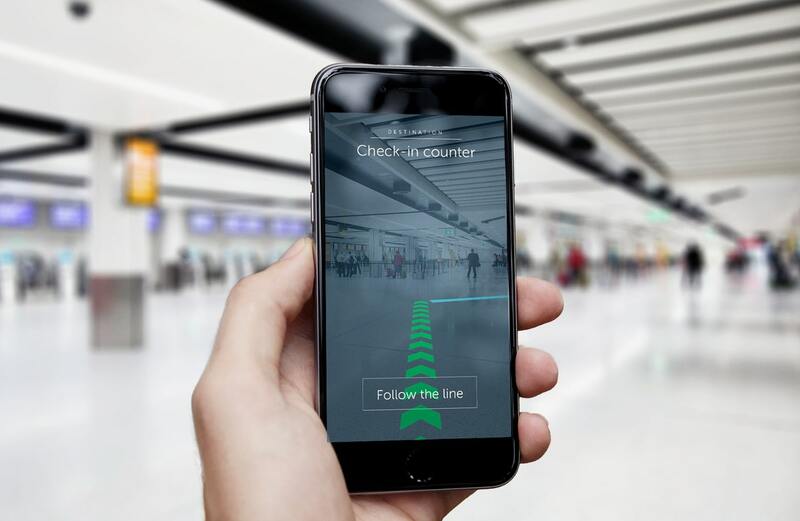 Gatwick airport just announced that it installed 2000 indoor navigation beacons to enable Augmented Reality wayfinding, the first airport in the world to do so. The lack of satellite signals makes road-based navigation systems – such as Google or Apple maps – unreliable indoors, so Gatwick has deployed a beacon based positioning system to enable reliable ‘blue dot’ on indoor maps, which in time can be used within a range of mobile airport, airline or third party apps. The system – which is designed to make it easier for passengers to find their way around the airport and avoid missing flights – is part of a £2.5 billion transformation programme for the UK’s second largest airport, which flies around 44 million passengers per year to over 228 destinations in 74 countries contributing £5.3 billion to the nation’s GDP. The network of battery-powered beacons was deployed in just three weeks (followed by two months of testing and calibration), and now provides a comprehensive system that is not only more reliable than GPS for indoor navigation, but also enables augmented reality wayfinding applications for passengers. What this means in practice is that information can be overlaid onto a user’s mobile camera view in real-time, making it much easier to find check-in desks, departure gates, baggage belts, etc. “We are proud to be the first airport to deploy augmented reality technology and we hope that this influences other airports and transport providers so that it eventually becomes the norm,” says Gatwick’s Head of IT Commercial & Innovation Abhi Chacko. The new navigation technology is now being integrated into some of Gatwick’s apps, but the airport is also in discussion with airlines to feature the service on their applications. All this sets the scene for the next logical application of this technology – advertising. Because although Gatwick emphasizes that it will not be collecting data beyond generic information on ‘people densities’ in various beacon zones to help improve operations and reduce congestion, it allows that airlines could go further and obtain consent from passengers to push personalized directions and reminders to individual passengers. “By providing the infrastructure we’re opening the door for a wide range of tech savvy airport providers, including our airlines and retailers, to launch new real-time services that can help passengers find their way around the airport, avoid missing flights or receive timely offers that might save them money,” adds Chacko. Although some people might feel uncomfortable with the prospect of so much information being known about them (and opt-outs should be available for those that are) airports are already a place where we routinely have to subject ourselves to enhanced security and monitoring, so it feels less of a leap somehow. And the flipside of that coin is that a lot of people might well think that sharing data is a price worth paying for a smoother experience and relevant offers sent their way. It’s certainly the general trend we’re seeing as location-based, Mixed Reality, Artificial Intelligence and Big Data technologies increasingly converge, and it will be interesting to see how such test cases pan out.